Jewelry has its own place in the closet. 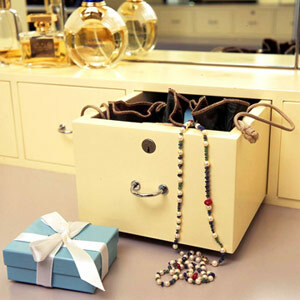 Small drawers are perfect for organizing hair accessories, cosmetics, and jewelry. Also, you can fit several drawers in a small amount of space, such as between wall studs, below a cabinet, or sandwiched between the mirror and countertop. that is nice.. love to get one someday. my mom would love this organizer! Don't have much jewelries,naka-store lang sila lahat sa tin can lol!